Why did news sites take down story on Amit Shah-linked bank getting huge sum of demonetised notes? 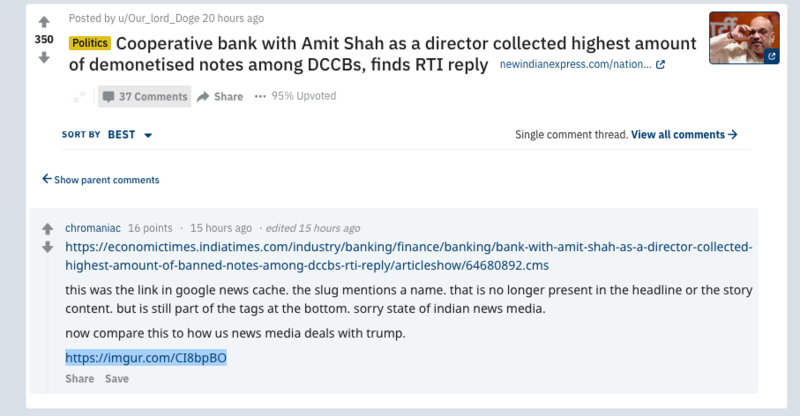 News18, Firstpost and Times Now among those that took down the story about the cooperative bank in which the BJP president is director. 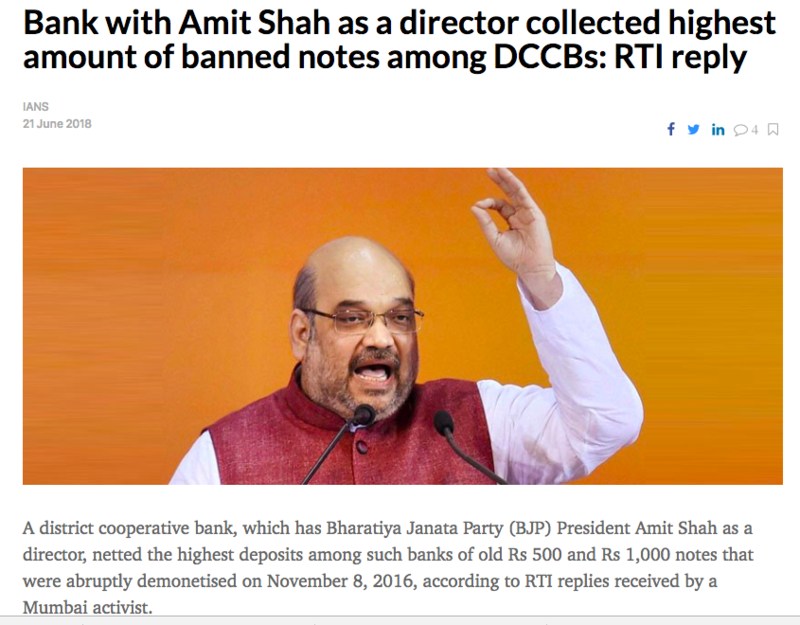 A few hours after they had put it up, a few news publications appeared to have taken down a story claiming that a district cooperative bank, with Bharatiya Janata Party President Amit Shah as director, had collected a disproportionately high sum of demonetised notes within days of the Centre’s decision to ban Rs 500 and Rs 1,000 currency notes on November 8, 2016. The report, first published by news agency Indo Asian News Service on Thursday, was based on the findings of a Right to Information plea filed by Mumbai activist Manoranjan S Roy. 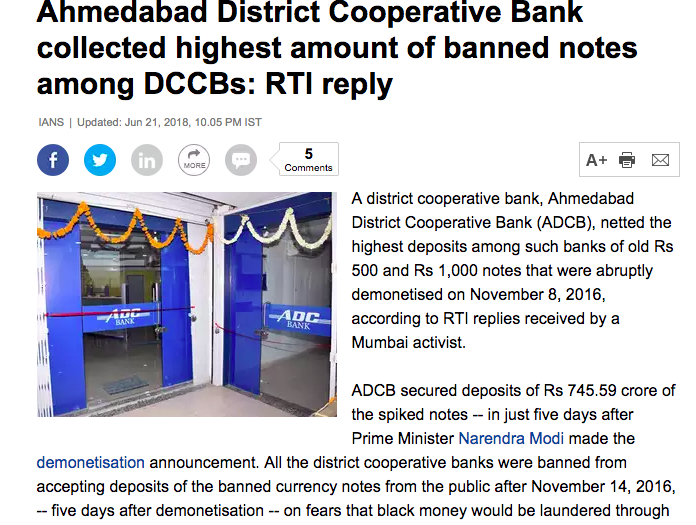 The report said that Rs 745.59 crore of demonetised notes had been deposited with the Ahmedabad District Cooperative Bank – the highest deposit among district cooperative banks. These collections were made within a six-day window till November 14, 2016, after which the Reserve Bank of India decided to bar district cooperative banks from collecting and exchanging scrapped notes, in light of concerns that the banks could be used to launder ill-gotten wealth. The bank’s total deposits on March 31, 2017, were Rs 5,050 crore and its net profit for 2016-’17 was Rs 14.31 crore, the IANS report said. 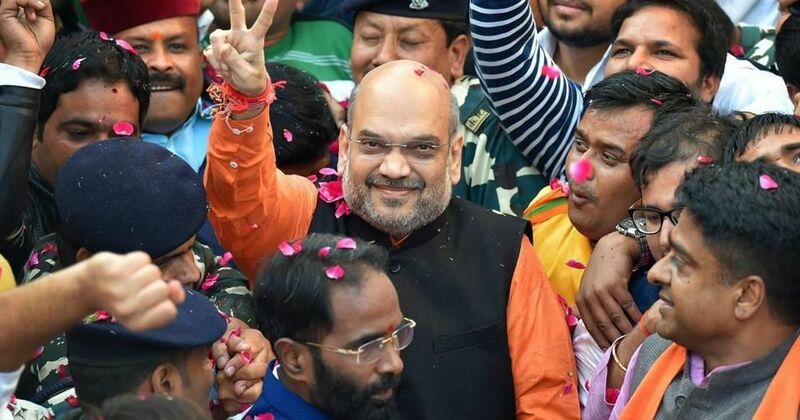 “According to the bank’s website, Shah continues to be a director with the bank and has been in that position for several years. He was also the bank’s chairman in 2000. ADCB’s total deposits on March 31, 2017, were Rs 5,050 crore and its net profit for 2016-17 was Rs 14.31 crore. Right behind ADCB, is the Rajkot District Cooperative Bank, whose chairman Jayeshbhai Vitthalbhai Radadiya is a cabinet minister in Gujarat Chief Minister Vijay Rupani’s government. It got deposits of old currencies worth Rs 693.19 crore. Among the websites that took down the story were News18, as Janta Ka Reporter noted, and Firstpost. While the links to the article on News18 showed a 404 error, indicating that the page could not be found, the Firstpost page could not be loaded, even as the rest of the website was responsive. Network 18 is the parent organisation of Firstpost and News18, which in turn is owned by Mukesh Ambani’s Reliance Industries. The New Indian Express also seems to have removed its initial story and then published it again. Scroll.in has reached out these publications for comment and will update the story if and when they respond. The Economic Times, meanwhile, carried the IANS report about the Ahmedabad District Cooperative Bank, but the BJP President’s name was missing from the article, even as the same report carried by several other publications mentions Amit Shah in the first line. (See the The Wire, Moneylife, Sify, among others). Interestingly, while the Economic Times story does not mention Amit Shah’s name in the copy or the headline, his name shows up in the tags used in the story. Edited to add: Alert readers pointed out on Twitter, that the original report in the Economic Times did have a direct reference to Amit Shah. 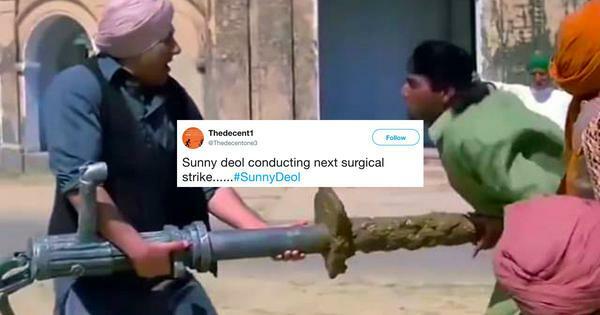 Scroll.in has also contacted the Economic Times for a response. At the time of writing this report, TimesNow also seemed to have taken down the story. The URL where the story appeared this morning now redirects to the home page. The BJP-ruled government had banned high-value currency notes in a surprise move on November 8, overnight rendering worthless about 86% of the currency in circulation at the time. The move was touted as a crackdown on black money and counterfeit currency (though in later days, the government claimed it would also end militancy in Kashmir and push the country towards becoming a digital economy). The government had given citizens time till December 30 to exchange their demonetised notes for new currency in instalments. 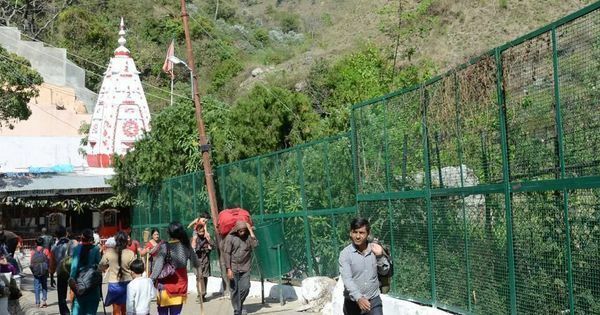 The subsequent period saw several policy changes and adhoc decisions by the government, including alterations to the amount of money that could be withdrawn or exchanged in one go, and a severe cash crunch stifled the economy. One of these sudden policy changes was the decision to stop district central cooperative banks from exchanging or accepting old notes, after allegations that large sums of money, presumably black, were being deposited in these banks. The IANS report about the Ahmedabad District Cooperative Bank also mentioned that the Rajkot District Cooperative Bank, of which Gujarat minister Jayeshbhai Vitthalbhai Radadiya is a chairman, had the second-highest deposits of old notes among district cooperative banks, at Rs 693.19 crore. In comparison to these, the apex Gujarat State Cooperative Bank Ltd had received just Rs 1.11 crore, the report said. State cooperative banks were allowed to exchange notes till December 31, 2017, the same deadline as the rest of the banks. “The amount of deposits made in the State Cooperative Banks and District Central Cooperative Banks – revealed under RTI for first time since demonetisation – are astounding,” Roy, the RTI activist who had filed the plea, told IANS. In all, about Rs 15.28 lakh crore demonetised notes – roughly 99% of the currency that had been banned – was returned to the RBI by the end of December. Of this, the RTI plea revealed, a little more than half that amount (Rs 7.91 lakh crore) had been deposited in a clutch of banks: Seven public sector banks, 32 state cooperative banks, 370 district central cooperative banks and about 39 post offices. Of this, the district banks accounted for Rs 22,271 crore, the report said. “Roy said it was a serious matter if only a few banks and their branches and a handful post offices, apart from SCBs [state cooperative banks] and DCCBs [district central cooperative banks], accounted for over half the old currency notes,” the IANS report said. 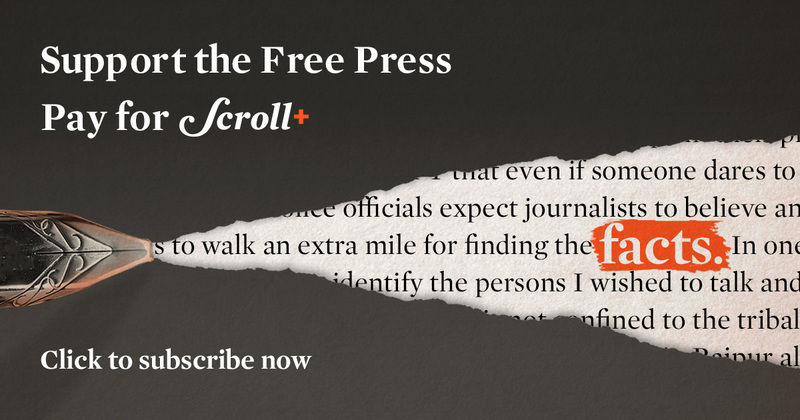 In September 2017, The Wire had reported that Times of India had taken down a story criticising the government’s Pradhan Mantri Fasal Bima Yojana. The story conteded that the crop insurance scheme was taking poor farmers for a ride. The story appeared in the paper’s Jaipur print edition. In October that year, NDTV had taken down a story by its Managing Editor Sreenivasan Jain about about the business dealings of Jay Shah, the BJP president’s son. Update: This article has been edited to include the fact that The New Indian Express has republished its piece.